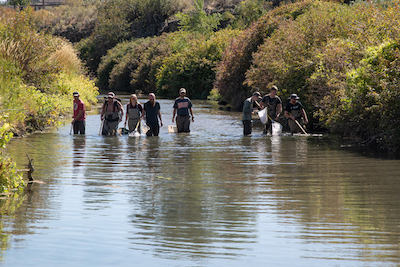 ISU fish ecologists Ernest Keeley and Janet Loxterman have identified some of the last remaining native, genetically pure populations of Cutthroat Trout, including distinct subspecies variations, in the areas around Pocatello. Recently, Keeley found a genetically pure population of cutthroat trout right under his nose, in a tributary of the Portneuf River that dumps into that stream within the city limits of one of the largest cities in Idaho, Pocatello. That tributary, City Creek, also features one of the most popular trails in the area and where it dumps into the Portneuf, the river is severely degraded. FUNDING: This project, "RII Track-1: Linking Genome to Phenome to Predict Adaptive Responses of Organisms to Changing Landscapes," was funded under National Science Foundation grant No. OIA-1757324. The total amount of federal funds for the project is $20 million, which amounts to 83% of the total cost of the project. The total amount of non-federal funds for the project is $4 million, which amounts to 17% of the total cost of the project. DISCLAIMER: This material is based in part upon work supported by: The National Science Foundation under grant number OIA-1757324. Any opinions, findings, and conclusions or recommendations expressed in this material are those of the author(s) and do not necessarily reflect the views of the National Science Foundation. CITING EPSCoR: If your work benefited from the use of EPSCoR equipment or an EPSCoR sponsored student worked in your lab or you received money from EPSCoR that contributed to your research or career, you must cite EPSCoR on all publications, presentations, press releases, requests for proposals, bid invitations, or any other documents or applications that describe projects or programs that were supported by EPSCoR. Example: "This publication was made possible by the NSF Idaho EPSCoR Program and by the National Science Foundation under award number OIA-1757324."